This Alfredo sauce recipe is one of my favorites. Actually I think it’s just about everyone’s favorite pasta recipe. It may not win the low fat diet recipe of the year award, but for a special treat you can’t beat cream, cheese and pasta together! I love lots of Parmesan cheese on mine. See below for tips that add more nutrition to this rich and creamy pasta recipe. Heat a large saucepan over high heat until very hot. Add just enough cold water to cover the bottom of the pan. Let the water evaporate (it will do this quickly) but make sure there are a few drops left in the pan. This will keep the cream from scorching and burning on the bottom of the pan. Remove the pan from the heat. Add the cream to the pan and return it to the heat. When the cream comes to a boil, reduce heat to medium/ medium high and continue to boil until it is reduced by half. During that time, add the garlic. In the meantime, cook pasta in well salted water according to package directions. Drain well when cooked. When the cream is reduced remove it from the heat. Add butter 1 tablespoon at a time and whisk it in. The cream should thicken and turn glossy. Add the cheese and hot pasta to the cream. Season with salt and pepper and garnish with chopped fresh parsley. Serve immediately (with added parmesan cheese for me!). Turning this into a penne alfredo pasta recipe or a fettucini with alfredo sauce recipe is easy – just change the pastas you use! The different shapes of pasta are all made from the same dough, so if you want Fettucini Alfredo, just boil fettucini noodles and mix it with this wonderful alfredo sauce. Change the noodles to penne pasta and you have a delicious penne alfredo pasta recipe. Simple Italian goodness! 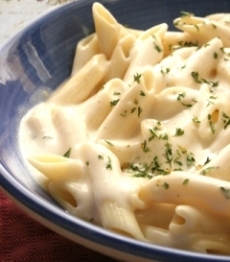 The classic pasta with alfredo sauce recipe is just that – pasta with a cheesy cream sauce. I love one dish meals, so I will often saute vegetables like zucchini, mushrooms, red peppers, onions and even more garlic and add them to the final dish. A meal in a bowl! Try adding some steamed broccoli to the pasta dish. We all love broccoli with cheese sauce. This one is kicked up a notch and yet another easy dinner recipe. If you need this recipe to be gluten free, simply pour the sauce over gluten-free pasta, like rice noodles or corn pasta. Add diced cooked chicken to the final product for added lean protein. Now here is a different idea – instead of pasta, add protein and nutrition by serving this alfredo sauce recipe over cooked quinoa! Super tasty and more nutritious. Great served with the perfect Caesar Salad. The chopped parsley adds color, flavor and nutrition. Parsley is extremely healthy for us and this rich recipe can use the health component. As Italian pasta recipes go, this is one of the best and most decadent. The sauce itself is gluten free. Simply change the pasta to your favorite gluten free variety as I noted above to make it a gluten free meal. Have a look at the Tips and Make it Healthier sections above to see how you can turn this simple pasta recipe into a variety of easy dinner recipes. Yummy alfredo sauce recipe – just one of our delicious Italian recipes. 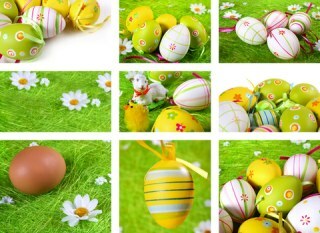 Find the collection here. No no no – Alfredo is only butter and cheese – no cream!!!!! From Karen: I think you really need the cream. It makes it really creamy while keeping it from being too oily with butter. You do know that butter, cheese and pasta is just butter, cheese and pasta. alfredo always takes cream or milk. thought you should know. Definitely will be using this recipe tonight !! thanks! Thanks, that was great! I had to substitute 10% cream, but everyone loved it still. This is a great recipe! I found that adding some garlic and Mozzarella cheese made the sauce richer too! Add spinach (nicely made) instead of parsley for better results! On serving size, U tried with a whole pack of 500g (about 1 pound) of spaghetti and it’s perfect. From Karen: Thanks Ann. Yes that should be about right. Tried it and it was easy and delicious. I made this recipe last night with a few changes. Rather than 2 cups of cream, I used 1 cup of cream and one cup of half and half. I also smashed 3 garlic cloves and infused them in the cream and added a few drops of lemon oil. I gently heated the cream mixture and brought it to a slow boil. I removed the garlic before adding the pasta to the sauce. I had grilled cedar plank salmon and served pieces on top of the Alfredo and side dishes of tomato salad and green peas. It turned out really well…Yummy! It serves 4…depending on serving sizes. loved it, added some bacon to it as well which added more texture to the pasta.